In addition to our well thought out plans, we have 50 more in which you can choose from ranging from 1,500 square feet to 2,700 square feet at our sales model. Call Brandon Adams for appointment at (910)523-0056. Open-face gables, broad white trim, and double-hung window sashes create appeal on this cottage's exterior. Inside, a comfortable and modern design of the great room caters to the active family requiring more functional than formal space. To Be Built! Welcome to beautiful Marsh Landing Place. Situated among the beautigul marshes and hardwood trees, this new, 2-story, Pasedena floor plan consists of 3 bedrooms, 2.5 baths, and large bonus room. marsh Landing Place is a gorgeous neighborhood tucked away in the desirable Ogden are with pool and clubhouse. Download "The Pasadena 911 Trace Drive" floor plan. Download "The Pasadena Lot 19" floor plan. 2,200 - 2,400 Heated Sq, Ft. The Hibiscus is a popular cottage style home. Kitchen boasts Granite countertops, large center island, stainless steel appliances, built-in microwave & self-cleaning oven. Hardwood & ceramic tile flooring. Master suite has a walk-in closet & luxury bathroom featuring a tiled shower & garden tub. Additional unique features include wainscoting, crown molding, and high vaulted ceilings with exposed decorative beams. FROG with full bath. 2 car garaage. 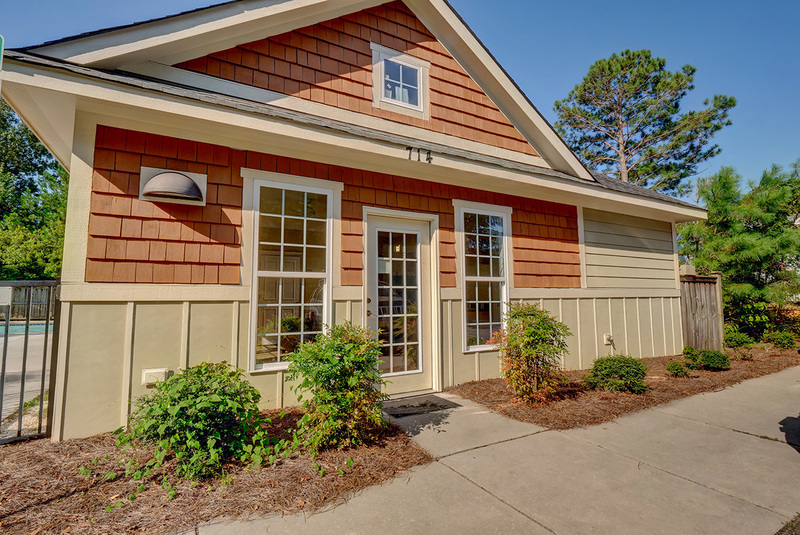 Conveniently located minutes away from Mayfaire, shopping, restaurants and Wrightsville Beach. Download "The Hibiscus" floor plan. $299,900 | 1,821 Heated Sq, Ft.
$320,000 | 2,150 Heated Sq, Ft. Spacious and stunning 3 bedroom, 2 bathroom English Tudor style brick home in the desirable community of Marsh Landing Place. Kitchen boasts Granite countertops, large center island, stainless steel appliances, built-in-microwave, fridge & a self-cleaning oven. Hardwood & Ceramic tile flooring throughout. Master suite has dual walk-in closets & its own bathroom featuring a tile shower & garden tub. Additional unique features include a convenient wet bar, wainscoting, crown molding, 9 ft. ceilings, built-in shelving, and stone accents inside & out, Elegant French doors in the dining area lead to a back deck overlooking the serene settings of Marsh Landing place. Download "The Montrosse" floor plan. Langston presents a fresh look at a modest stone cottage. It features a romantic exterior complete with a Country French atmoshphere. This one-level house feels larger than it is, with high ceilings, numberous windows and open rooms. An engaging entrance users you int th foyer, where the 13-foot ceiling provides a sense of spaciousness. The spacious kitchen and creakfast room, with its wall of windows, are to the left of the family room. The master bedroom is located on the left side of the house, the other two bedrooms on the right. Frank Betz Associates, Inc., of Smyrna, Georgia, has designed an optional space for the second floor. If needed, this room with full bath can be the perfect guest retreat or home office. Access is provided by stairs near the kitchen. Download "The Langston" floor plan. The Martin's great design and courtyard entry allows it to fit perfectly on any home site. With its distinctive floor plan will all bedrooms on one side of the house, the Martin is perfect for the family with small children who need to stay close by for convenience. It also lends well to the empty-nesters. Aside from the bedroom configuration, this open floor plan allows for a generous gathering of friends with the open and flowing current from the kitchen to great room to dining room. You will also see the ease of morning from breakfast room to screen porch or optional sunroom when the weather is nice. And don't forget, the optional bonus room, or fourth bedroom, offers additional privacy and space. Download "The Martin" floor plan. If you're trying to get the best of both worlds the Winston may be the house for you. With the master suite and upstairs bedroom on one side of the house, and the third bedroom and office/study on the other, this plan works well for the busy family. The dining room sits across the hall from the study, offering two rich and formal rooms to encounter upon entering the house. The opposite end of the dining room flows into the spacious great room which looks out into the patio/sunroom and beyond to the backyard. If versatility and luxury have seemed impossible to find together, look no further - the Winston has it all! Download "The Winston" floor plan. 2,400 - 2,500 Heated Sq, Ft.
Download "The Ventura" floor plan. Download "The Windsor" floor plan. Copyright © 2019 MarshLandingPlace.com | All Rights Reserved.